St Chad's Church was founded by Chad in AD 669. There has been a church on this site for over 1300 years. In the year 669 Chad came to Lichfield to be its first bishop and he settled his habitation at a secluded place in a shallow, watery valley where a stream divided to form a small island. Here he founded a small monastery, beside a well of spring water. 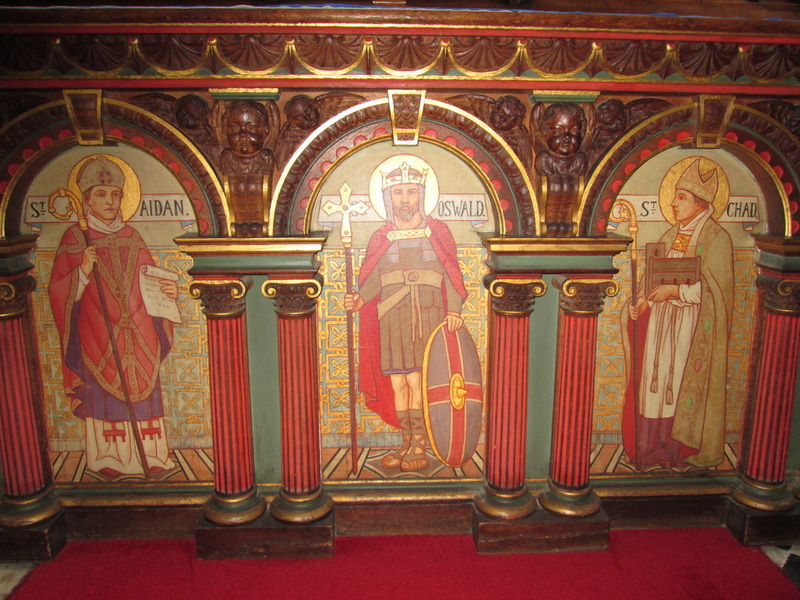 Inside the church, on the front of the high altar, are three panels which depict St Aidan, St Oswald and St Chad. St Aidan died in 651. He was an Irish Bishop who went from lona to Lindisfarne at the request of King Oswald to help him convert his people to Christianity. Aidan promoted the building of monasteries and schools; he travelled far, preaching and ministering to the sick and needy. St Chad was one of the twelve pupils in the first school he set up in Lindisfarne. St Oswald was born 605 and died in 642. He was King of Northumbria and had been brought up in Columba’s monastery at Iona and he looked to the monks to help him establish Christianity in his growing Kingdom. St Aidan was chosen specifically to assist him. St Oswald was successful in extending his kingdom and thereby spreading Christianity until he was slain in a battle with the pagan King Penda of Mercia. Therefore the link between St Chad and St Oswald would appear to be St Aidan, his example and his teachings. The west facing window in the welcome area at the west end of the south aisle shows Christ blessing children. It was made in 1916 by Curtis, Ward and Hughes in memory of John Chappell and George and Eliza Cartmale. The window was donated by the family. This part of the Church used to house the font before it was moved to the front of the Lady Chapel. The window is in keeping with baptisms. are in memory of Nelly Thorpe, died 7 July 1919 and her grandson Christopher Godfrey Asquith Benson, died 23 April 1919 and were donated by their family. 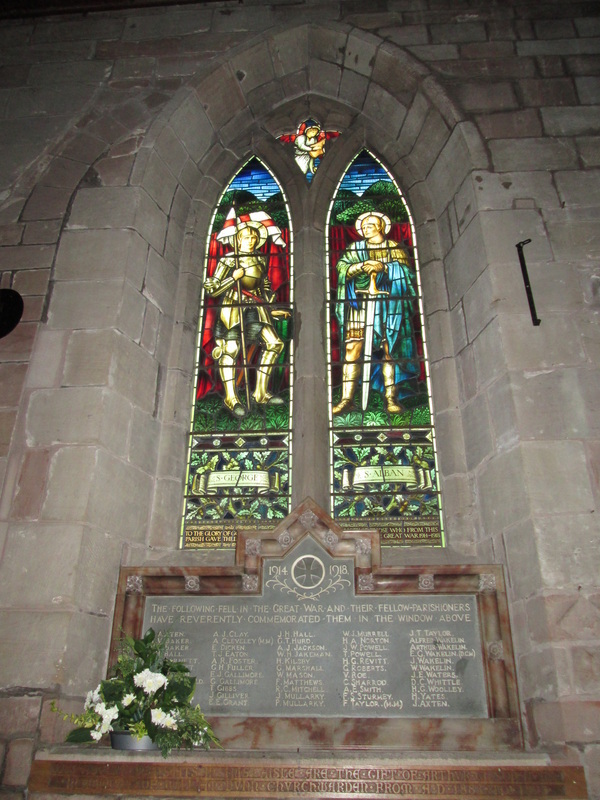 The two windows in the Lady Chapel are by Christopher Whall and date from 1905. They are in memory of Thomas and Mary Haywood and illustrate the teachings of Jesus. One of the windows depicts the parable of the talents. in 1896 and is in memory of Grace Brown 1876 and Patience Brown 1886.